VermisTerra® Earthworm Casting Tea is a microbial solution prepared by a proprietary technique. It is an excellent fertilizer that help increase the ecological diversity and vitality of the soil. As a byproduct of vermicompost, it contains all the benefits of earthworm castings and more. Viable plant health and production rely on their relationship with beneficial microbes the tea provides. 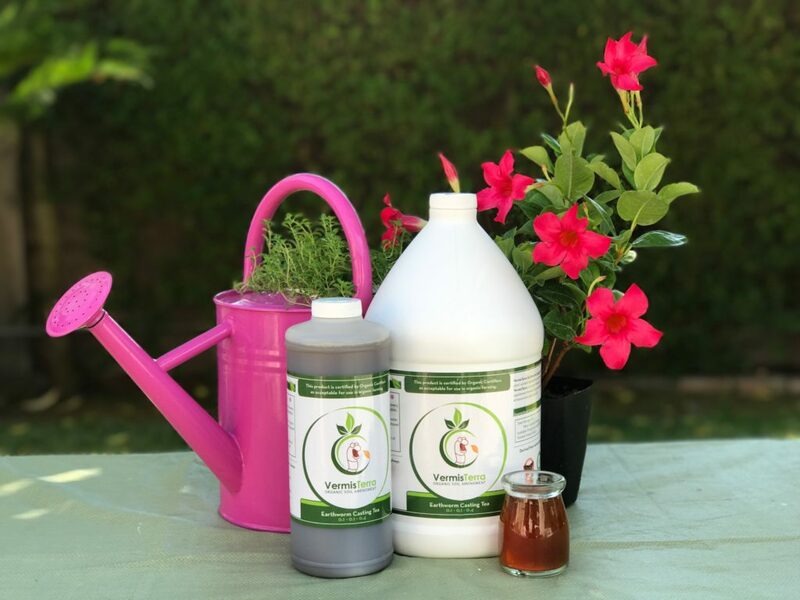 Applying our high-quality Earthworm Casting Tea will make your plants more vigorous and more capable of withstanding diseases and pests. Microbes in the teas have the ability to create pore spaces in the soil. More oxygen are able to penetrate into the soil for even more biological activities to occur. As well as plant roots can root into the soil more easily. Well structured soil also soaks up water like sponge to retain water for longer periods. 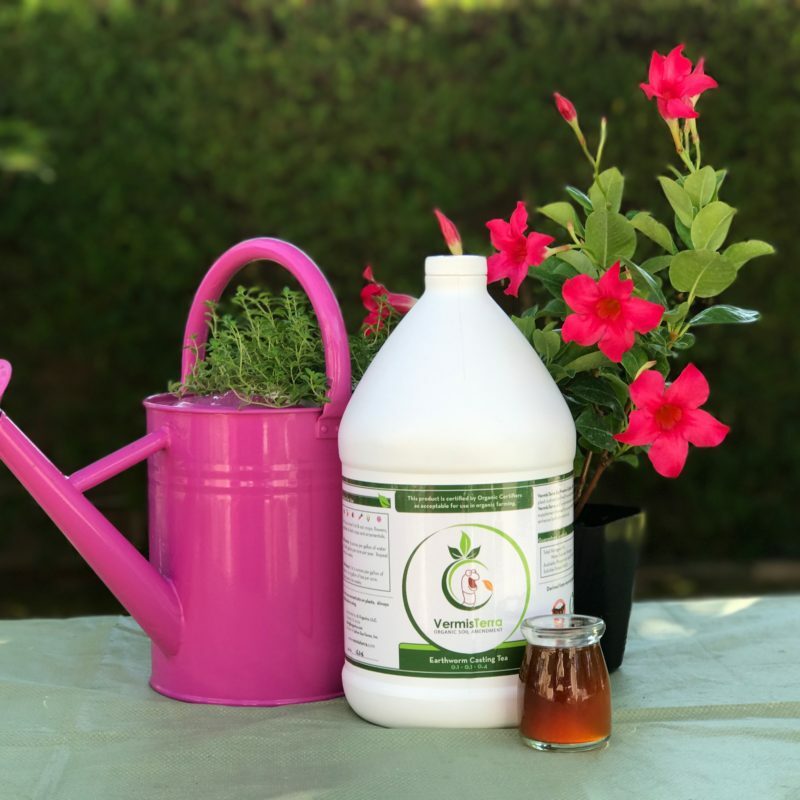 With the Tea providing available nutrients and the microbes enriching the soil, plants will healthy and tough to be more naturally unyielding to pressure from undesirable pests. 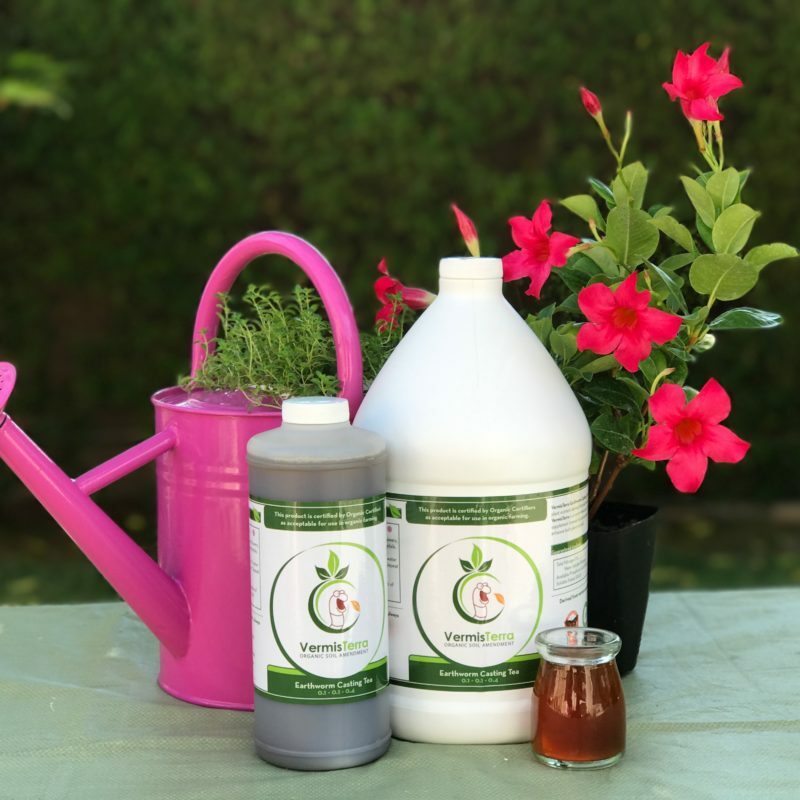 With VermisTerra Earthworm Casting Tea, nutrients and disease and pest control are incorporated therefore use of other chemical fertilizers and pesticides are eliminated. This keeps you, your children and pets safe as well as being helpful to the environment. 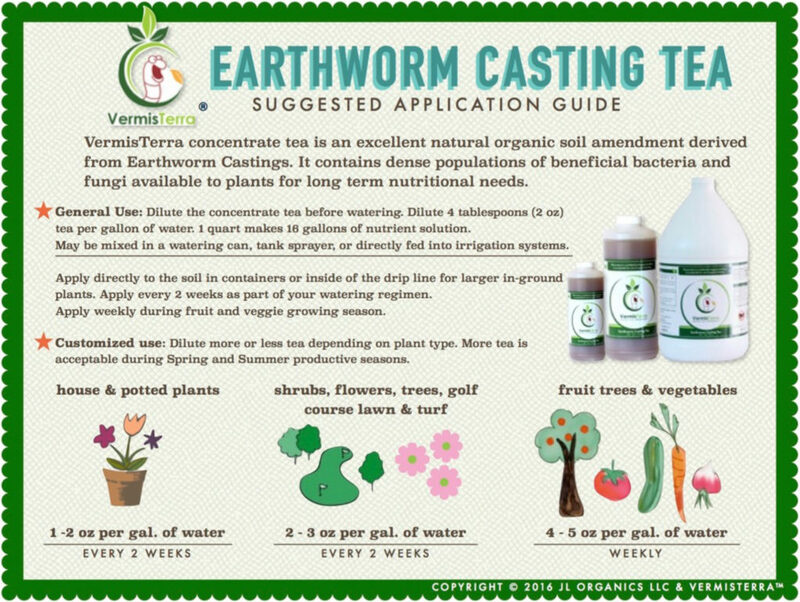 Unlike standard compost teas, VermisTerra Earthworm Casting Tea does not have a limited shelf life of a few days. 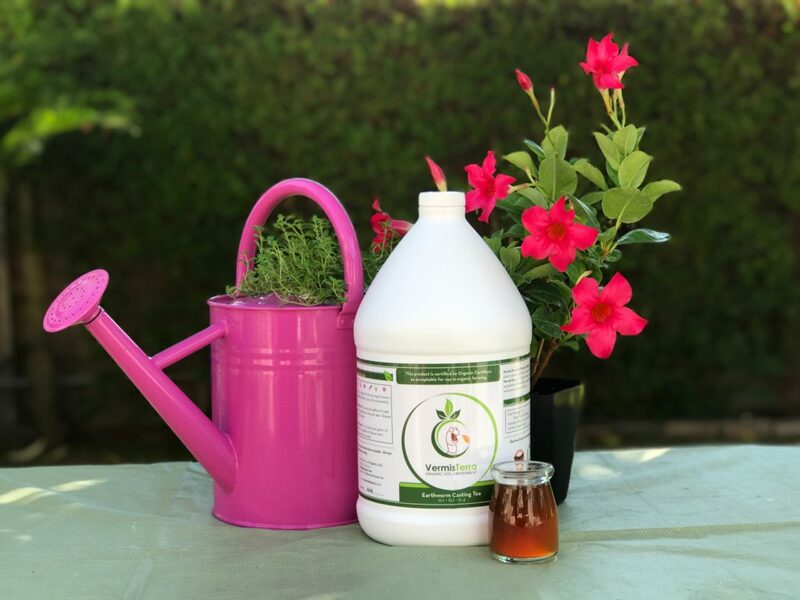 Since the necessary micro-organisms require oxygen to live, compost tea begins to lose it’s effectiveness right after aeration is cut off. As a result, harmful pathogens such as E. coli and Salmonella causes a concern as they feed on the bacteria that die off in the compost tea. 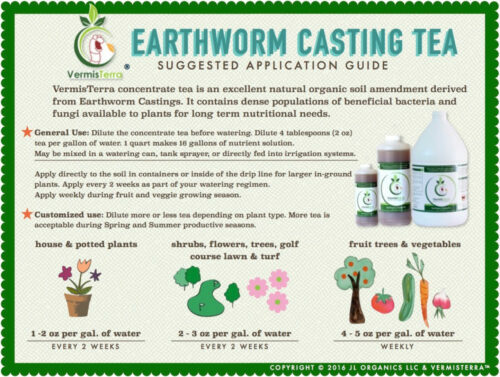 VermisTerra Earthworm Casting Tea breaks down to even smaller forms of bacteria and contains a higher concentration of nutrients than compost tea, so it can be stored for later use. High amount of nutrition are released through the workings of many micro-organisms within VermisTerra Earthworm Casting Tea in addition to the nutriment already present. The microbes break the available nutrients down to be easily picked up by plants.